What Does It Feel Like To Be an Israeli-Arab? 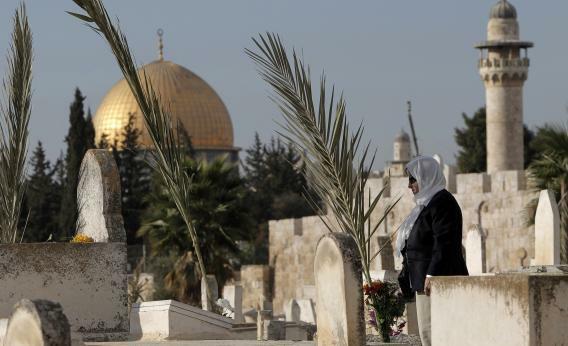 Palestinians pray at the graves of loved ones in a cemetery near the Al-Aqsa Mosque compound in Jerusalem’s Old City during Eid al-Adha, or the Feast of the Sacrifice, marking the end of the hajj. Israel is home to many Arabs who feel conflicted about living in a Jewish state. I am an Israeli Arab. Conflicted and stressful are two of the easier words to pick. Where do I start? Growing up in an environment that by definition embraces inequality by design is uncomfortable. It is not the naming that bothers, but the implementation and expectations people set. “This is a Jewish Country!” people would argue when faced with questions about equality. It’s 2012, and not a single mainstream party in Israel would call out for defining the state as the state of all its citizens. Attempts to do so by groups or parties would shun them into the “radical” bucket. Having people disagree with you that equality is a basic right is highly demoralizing. Setting the stage: Arabs make for about 18 percent to 20 percent of Israel’s citizenry. Since the formation of Israel, more than1,900 Jewish-majority community settlements (small towns) were formed and numerous modern cities. Arab schools, as the school systems is separate by default (Most Jews and Arabs learn in separate schools). Difficulty in building Arab cultural hubs: cafes, community centers, youth bodies (Without critical mass, there’s little financial sense to open any of those). Clan mentality remains a dominant factor, as the surrounding habitat does not allow for a city-life experiences: More privacy, families are spread out in more distant areas, multistory buildings that boost the family vs. community ratio. Due to No. 2, municipality level politics are rigged: one clan votes to Clan No. 1, the rest to Clan No. 2, who in turn slice the cake to the whomever voted them in. No. 3 makes it nearly impossible to actually fix problems in a village. Lack of adequate infrastructure prevents modernization. This is especially evident when contrasted with Arabs, especially students, living in Israeli cities like Haifa. Life tyles are no different than their peers in London, Tel Aviv, ir Munich. Education is a big one. Recent articles in mainstream Israeli media show 20 percent to 37 percent less investment in the education budget reaching Arab students. Eleven percent of university undergrads are Arab, 9 percent of graduates, 7 percent of masters students, 3 percent of Ph.D students, and 2 percent of university academic staff. This leads to vast socio-economic gaps between the two communities, leading to higher crime rates and lowered aspirations and hopes. In the booming high tech industry in Israel, less than 4 percent of the workforce is Arab. Arabs in Israel are not part of the public discourse on how the country is and will be shaped. Polls in recent years have stopped polling Arabs, specifically mentioning that polls reflect Jewish opinion. Political parties in the government are elected based on slogans such as “No Loyalty, No Citizenship,” suggesting to the Jewish majority that the Arab citizens are somehow collectively not loyal. Racism in its purest forms. Remarks on superiority are common. Phrases like “We’re not like that, we’re not Arabs” are thrown in any negative context. The occupation of Palestinians. We’re by definition Palestinians, and folks from the West Bank and Gaza are literally family to many. Seeing them living under military occupation, while we live in relative freedom, mixes feelings even more. Leading city municipality/community leadership in Israel openly call for racist behavior such as not renting or selling flats to Arabs (Carmiel as an example). On the flip side. Life is relatively comfortable for the Arab middle class and higher. Those who meet the socioeconomic bar cannot help but enjoy access to good public health care, purchasing power that satisfies most ordinary people, and decent-paying jobs, even for the working class. Life is super safe compared to the region. Basic freedoms are mostly upheld by the law and physical attacks due to racism seldom occur. For the more fortunate among us, higher education and hard work are fantastic tools to get ahead into a better life. Do excuse me for posting this anonymously, as life opportunities in Israel become vastly more limited for me if my name is Googled up and this post is surfaced. Why is there widespread anti-Israeli sentiment among the British? When Israelis come to the U.S., what are they most surprised by? What’s it like being in Israel during the most recent Hamas rocket attacks?